From August 19 through August 27, a group of 15 boy scouts (ages 10-14) from West Shokan Troop 163 – along with their scoutmasters – are planning to hike from the Ashokan Reservoir in Ulster County to the Central Park Reservoir in NYC. The trek commemorates the 100th anniversary of West Shokan Troop 163 which was formed by the engineers who built the Ashokan Reservoir. The trek route follows the Catskill Aqueduct, North County Trailway (for 20 miles of biking) and the Old Croton Aqueduct. Throughout the trek, the scouts will participate in a series of educational programs and local service projects to learn about the NYC water supply system. Learn the background, view the trek itinerary, get to know the scouts and partners in this historic event. 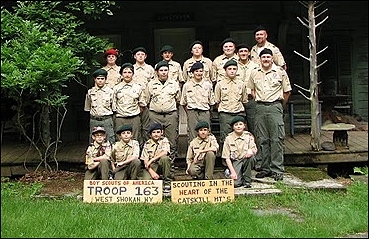 Troop 163 was formed 100 years ago when Sidney Clapp, an assistant engineer working on the Ashokan project with the NYC Board of Water Supply, organized 20 local youths into one of the first Boy Scout Troops in the US. A look back in time to the construction of the Catskill Aqueduct courtesy of DEP Archives.